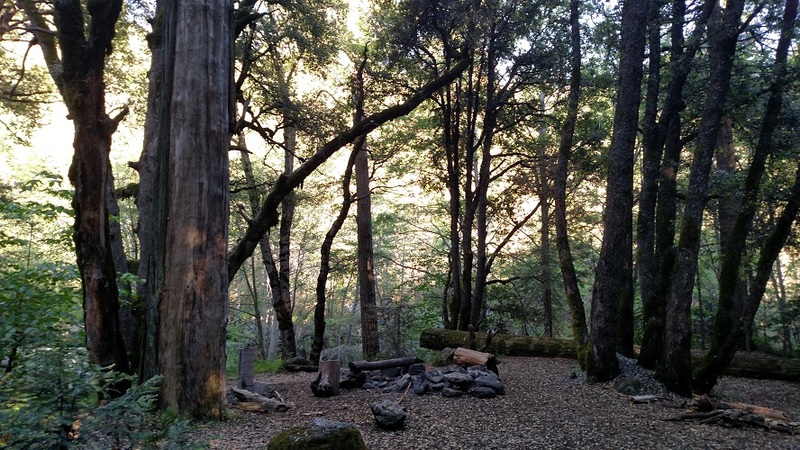 Location: Giant Sequoia National Monument east of Porterville in Tulare County. From Highway 99 north of Bakersfield, take Highway 65 north for 42.5 miles to Highway 190. Head east on Highway 190 past Lake Success and Springville for 24.5 miles. Bear left onto Wishon Drive/Road 208 (signed for the campground). Follow this winding, one-lane road for 4 miles to a fork. Turn left (signed for the day use area) and drive 0.2 mile to a dirt turnout on the right side of the road. Call 559-539-2607 for road conditions. 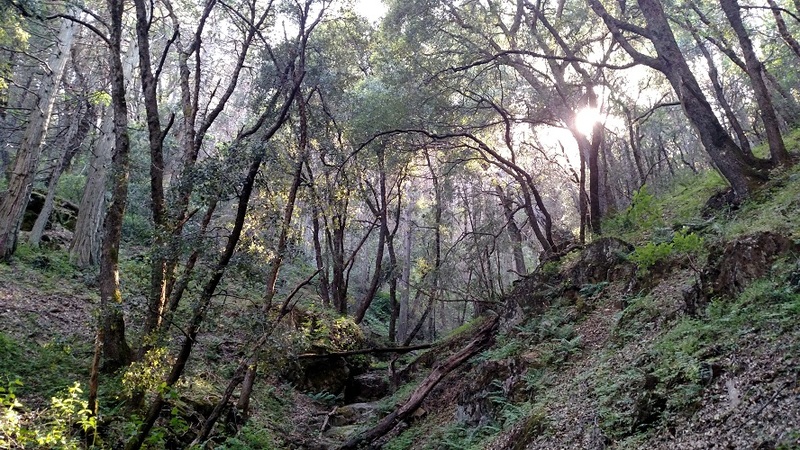 The Doyle Trail offers a taste of the Sequoia country without the crowds found in the national park. Its southern location makes it enticingly close to Los Angeles – not much farther from some parts of the city than Big Bear Lake or Joshua Tree. It can be worked into an enjoyable weekend of camping at Wishon or for ambitious hikers who don’t mind a lot of driving, a long day trip. The trail, which sits between 3,900 and 4,800 feet above sea level, is almost entirely shaded, meaning that depending on conditions, it can be a good year-round destination. 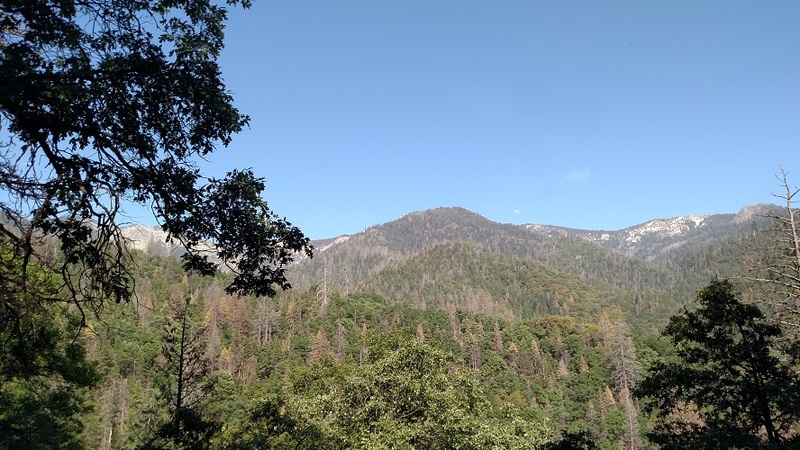 It doesn’t have the same wide-ranging views of the trails in the higher Sequoia country but there are a few glimpses of the rugged mountains above along the way. The Doyle Trail is named after 19th century pioneer John Doyle and also overlaps with the longer Wishon Trail, which continues north to Mountain Home State Forest. From the parking area, pass the gate and follow the crumbling paved road about a quarter mile to a signed turnoff on the left. The Doyle Trail climbs steadily up a few switchbacks before leveling out and following an enjoyable, easy course through the woods. 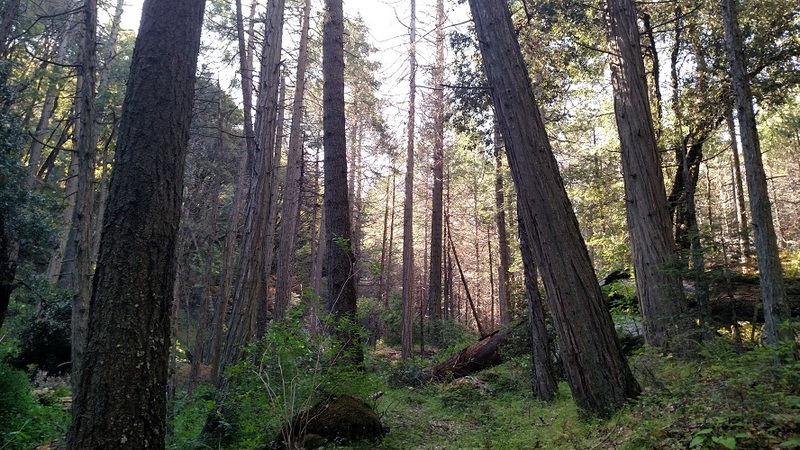 The vegetation is typical of the transitional climate of this altitude: mainly black oaks, pines and manzanitas that are much taller (20-30 feet) than their L.A. area counterparts. There a few young sequoias as well. At 1.3 miles, you reach a Y-junction. 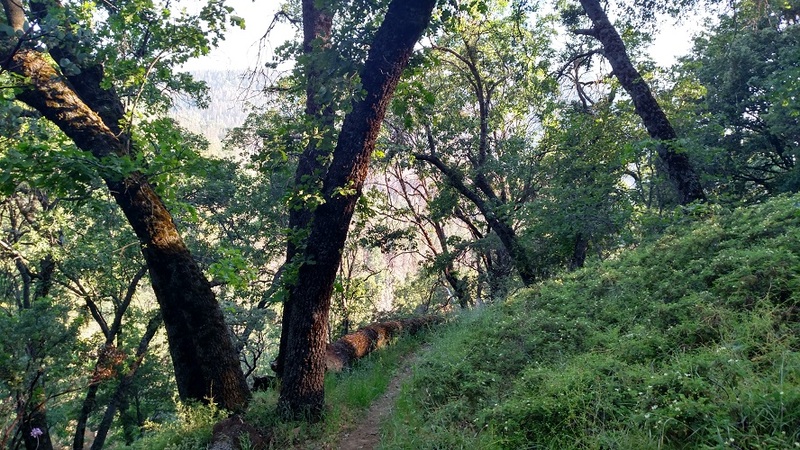 Stay left and climb through the forest, soon reaching a break in the trees where you can see the mountains on the opposite side of the Tule River gorge. 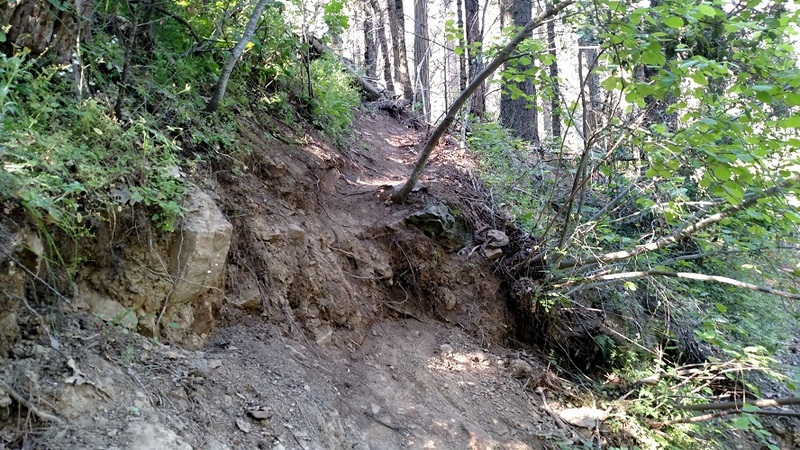 At 2.5 miles, a portion of the trail has been washed out. Carefully negotiate your way around. 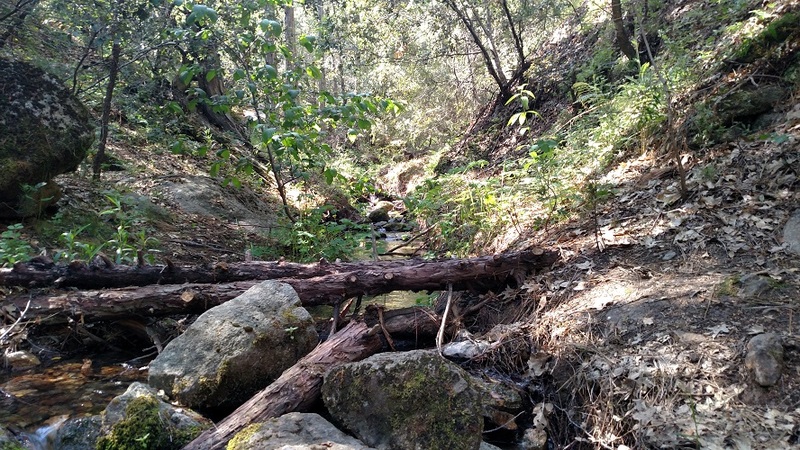 After this obstacle, the trail drops 100 feet to just above the North Middle Fork of the Tule River, where a primitive campsite has been established. Past the campsite, the trail continues north, paralleling the river. You’ll need to scramble over a few downed trees, sometimes obscuring the trail, but the route generally isn’t too difficult to find. 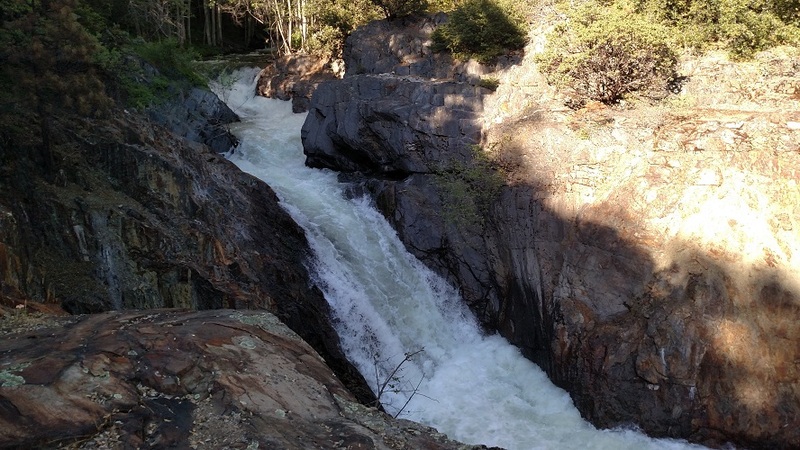 At 3.2 miles, the trail emerges from the woods into a small, rocky clearing above a medium-sized (about 30 feet) waterfall. The Doyle Trail continues past this point, but this is a good turnaround spot for a moderate day hike. Thanks for the details, I have hiked part of the trail each year with scouts, never new the history of the trail, great trail in April and May. Hi Paul, glad you enjoyed the write-up. Thanks for reading and happy hiking.